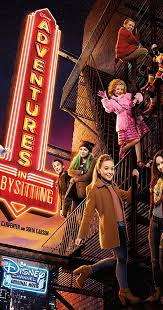 Adventures in Babysitting (2016) Rated TV-G | What to Watch. Two teen rival babysitters join forces when one of the kids sneaks into the city. Starring Sabrina Carpenter, Sofia Carson, Nikki Hahn. This film is a remake of the 1987 film by the same name, which remains one of my favorites to this day. I will say that this is one of the better remakes I have seen. They retained the central theme and quality of the original while making it distinctive, especially with the use of two babysitters. I also appreciated that they made the characters age-appropriate, particularly Carpenter who was amazing as a younger version of Elisabeth Shue’s character from the original film. This is a wonderful romp through a nightmare night of babysitting. It’s a fun film and worth a watch. This entry was posted in 2016, Adventure, comedy, Disney Channel, family, films, Movie reviews, movies, Rated TV-G, reviews and tagged 1987, 2016, actors, Adventures in Babysitting, age, babysit, babysitters, characteristics, city, Elisabeth Shue, favorite, film, film reviews, films, friend, job, kids, movie, movie reviews, movies, night, Nikki Hahn, one, original, remake, Remakes, rival, Sabrina Carpenter, Sofia Carson, teen, teens, trailer, two, version, worth, younger. Bookmark the permalink. Pingback: New This Week on DVD, June 28, 2016 | What to Watch.